Peter Short has joined last season's Aviva Premiership surprise package Exeter Chiefs on a one-year deal from Bath. 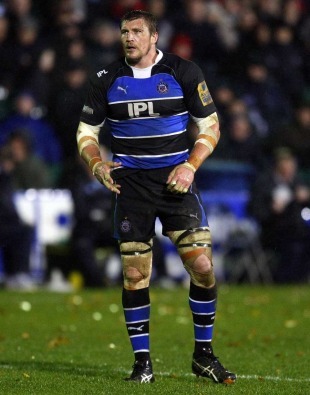 The monster lock, weighing in at 19-stone, had an injury ravaged season with Bath last term making just six appearances, but in six seasons at The Rec he turned out for the West Country side on 145 occasions. Short looked set to join Top 14 Orange side Stade Francais, but due to the upheavel happening in Paris, the deal fell through. Exeter Chiefs coach Rob Baxter pounced and is delighted to have got his man. "We had a look at him before he decided to go to Stade Francais. We met him a while ago but it looked like that had gone cold for us. With developments at Stade things changed and when he became available again we met him again and had another chat and watched more games because he came back fit towards the end of the season, including playing against us," said Baxter. "He didn't play much last season, but we feel he can add something to the squad. He's the type of player I was looking to bring in to the front five. He's a bit bigger and sometimes that element of bulk is what you need in certain games and at certain times of the year. He's also a good line-out forward and good at restarts, which sometimes you don't see as the job of the bigger second rows. He's capable of playing in the back row and that's a good fit for us because we ask a lot of our front five, we expect them to work very hard and get through a lot of work. He's a bit older and the benefit of that is that he brings a lot of experience to a younger pack. He ticks a lot of boxes for us so it was an easy decision to go for him once he became available again." Despite being one of the inform Premiership locks a couple of seasons ago, Short has struggled with injuries of late, but Baxter insists he has no concerns over the fitness of his new second-row. "In many ways he's in great shape physically. He's about 120kg but only about eight per cent body fat - he is in great shape. He had a bicep injury last season but that can happen to any forward over the course of their career - we've had several players do that at the club and they've all come back fine. He's also had an ongoing knee injury throughout his career but it hasn't stopped him playing," Baxter said. "We've done a full screening and we know what the concerns are, but if you checked any forward at this time of year they would all have bits and pieces wrong with them. Tom Hayes and James Hanks were bashed about last season but it didn't stop them playing. I'm very confident Peter is the sort of person who knows how to manage himself, how to look after himself after training and after matches to keep himself in the best possible condition." Short follows in the footsteps of fellow second-row Aly Muldowney who has joined from Glasgow Warriors and the lock is relishing the chance to run out at Sandy Park. "Obviously I've had some really good few years at Bath, but things are starting to change up there and I'm now looking forward to a new challenge with Exeter. The set-up is clearly fantastic and you can see the club is built on solid foundations. Talking to Rob as well, he's an impressive guy and I liked what he had to say about the future direction of the club. You can see the club are wanting to build on last season and I want to be part of that as well," Short said. "Exeter had a great season last year and full credit to them for that. You can see they are a tight group of players, they're well-conditioned, and they know what they are doing and they want to get better. As I said, it's going to be a new and fresh challenge for me, but it's one that I am relishing."